~A Tribute to a Great Actress! Ellie Cornell is a pretty actress who appeared in several movies, my two favorite of course were Halloween 4: The Return of Michael Myers and Halloween 5: The Revenge of Michael Myers. In those 2 movies, she portrayed the smart, sinsible character Rachel Corruthers, Jamie Lloyd's teenage foster-sister. Rachel, in part 4, loved Jamie Lloyd a lot, even though Jamie spoiled a date she was supposed to have with a classmate named Brady. Rachel was also worried about her weight, even though I don't think she looked bad at all. Throughout the movie, Rachel risked her life time and again for Jamie and never put herself first. In part 5, Rachel wasn't in the entire movie, in fact she was only in the first 15 minutes or so. But in the short time she was there, she added a very pleasant tone to the film. Her love and compassion for Jamie was very obvious. Also, she had grown a friendship with Dr. Loomis, and confided in him her personal feelings, such as guilt for leaving Jamie behind on Halloween because her parents wanted her to go to a cabin with them. Her death shocked more than one Halloween fan, and even now people still look back at her and wonder why she had to die. I am hoping that since Free Enterprise marks the return of this fine actress from her hiatus, because I would love to see her in more movies. Who knows? Ellie could be in Scream 3! Ellie, I doubt you'll ever see this page, but if you do...PLEASE, PLEASE e-mail me! I would love to either meet you, or do an interview with you! And I would also like to say THANK YOU for gracing the Halloween series with your presence, and Halloween 6 and H20 will always be lacking something...you! I didn't conduct this interview...although I wish I could have! Big thanx to the Official Halloween Homepage for this interview! HALLOWEEN 4 marked the return of the long-dormant Michael Myers. It also introduced a whole new family to be haunted by his curse - the Corruthers. Of course, while Michael was mainly on the hunt for little Jamie Lloyd (played by Danielle Harris), a major obstacle in his path was Rachel, her step-sister...played by Ellie Cornell. Truly, Cornell is a remarkable member of HALLOWEEN alumni. "It was one of the best and scariest movies I've seen," recalls Ms. Cornell on John Carpenter's original thriller, which she saw for the first time when it aired on television in the early 80's. "It wasn't too gross...a classic." Although she had not seen the second installment, she did catch HALLOWEEN III, which seemed to have her a little worried at the time about acting in a fourth film. However, Director Dwight Little (who went on to direct FREE WILLY 2) tried to set the tone as close to the original as possible. Ms. Cornell also points out how important key character development is to the success of any movie. "Jamie Lee Curtis [Laurie Strode] was such a serious and strong character." "Charming!" is the only word to describe Donald Pleasence. 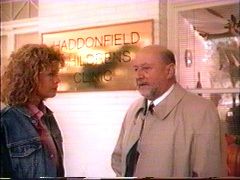 "He wasn't as much hands on...he could [play Dr. Loomis] with his eyes closed! I was very honored to work with him." Ms. Cornell also got along quite well with a younger cast member. "Danielle Harris was awesome! Sweet as she could be." The two grew very close on the set...it was their first starring roles and they became good friends - as well as with director Little. But it wasn't all fun and games either. "There was a TON of physical work," Ms. Cornell says. The crew set up the roof-top scene out in the Rolling Hills, outside of Salt Lake City, Utah to shoot the sequence at night. Ms. Cornell shudders remembering a nail on the roof getting stuck in her torso as she slid down the rooftop. Working all night and sleeping all day was a bit hard on both of the starring girls. The shoot lasted about 41 days and Harris and Cornell were required to be on set for "something like 36 days of those." Originally, Cornell wasn't planning on returning for Part 5. "I really liked the character," she says - and since Rachel was one of the only characters in history to survive the wrath of Michael Myers...she returned in Part 5. "I didn't like the philosophy in Part 5," Cornell says. It was a quick job for her though...she flew in for 2 1/2 weeks of shooting and was gone until the ending scene in the Myers' house. She did get to re-write her own death scene. Originally, the script called for the scissors to be shoved down her throat...but Ms. Cornell wasn't too keen on that idea. HALLOWEEN 4 of course opened up as a major success. Spending three weeks at #1 in the fall of 1988, Ellie Cornell had a hit on her hands. "I was able to say I had a lead in a recognizable film." She appeared in a Disney film, and worked on television some, such as a guest star on the show GABRIEL'S FIRE with James Earl Jones. Cornell has been out of the business now for 6 years...taking time off to start some businesses and for other personal things. As for acting - she'll probably a return (as Michael did those years ago) soon - "Acting...it's a ball!" Rachel Corruthers...and Halloween in General: A kewl Halloween fan sight, and fun! Created by yours truly! Lothos_40@hotmail.com: E-Mail me, I'll write back! Oh, and don't try to click on my e-addy, cuz it'll act like a link.